4 chambres, 3 avec lit queen et lits doubles, 1 a un lit superposé qui est un double sur le fond et unique sur le dessus, plus deux canapés-lits - un lit queen et un lit double. Il est mis en place pour accueillir les familles et les grands groupes. De superbes vues sur les montagnes et situé à distance de marche facile à tous les commerces et restaurants de la ville. Il ya une salle de lavage avec laveuse et sécheuse, Directv avec «TV 52, barbecue à gaz grill et terrasse couverte pour se détendre profiter des longues soirées. La table à manger pourra facilement accueillir 12. La cour est clôturée et assez grand pour les enfants à jouer à des jeux et dissipent cette énergie supplémentaire. Ouray a plusieurs titres: Suisse de l'Amérique, Jeep capitale du monde ... Minière historique ville de l'époque .... apportez votre 4 x 4, vtt, et de la famille pour des vacances vous ne serez pas prêt d'oublier. Our group consisted of 9 middle aged guys on a dirt bike trip. This house was our home for 6 nights. It enabled us to cook, relax and access Ouray by foot. There was enough parking for 3 trucks with enclosed trailers. Inside we had room to study maps and plan our rides. We shared laughs around the huge dinner table and appreciated having a dishwasher and laundry machine. The owners are very gracious. I’m privileged to have stayed in their wonderful retreat house. This was a great group. Glad they chose our home and we would welcome them back. They took great care of the home and left it clean and as we asked in our checkout instructions. We love having guests who enjoy and respect our home and all of Ouray. It felt like we were staying at a friend's home. There was ample room for all and it was kid-friendly. It was nice having a fenced in yard and the grill since the weather is so lovely in the summer. 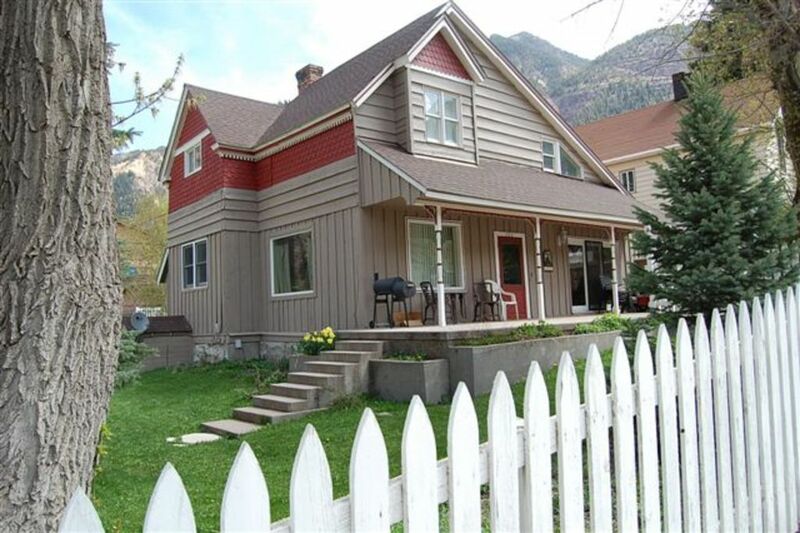 The location is easy walking distance to the main street in town but quiet. If I'm being honest, it was slightly off-putting to have so many personal effects all around the house (there were many half empty shampoo/conditioner bottles, too many kitchen things, personal items in some drawers). The owners have thoughtfully appointed this home, but if it were up to me, I would edit out much of the extra stuff. Overall, we loved our time here. If you have a large group, book this place now, you will be glad you did! Loved the charm of the older home. The biggest thing for us was the location to the town, we could walk anywhere we wanted. Perfict. Only issue was one person had to have a room with a curtin for a door. This ended up me as i gave my guests the nicer rooms. Nice having three full baths and we very much appreciated the Keurig machine for quick AM coffee! Look forward to returning next year. We had an amazing time in Oray, and staying at this house was part of that experience. Three baths, plenty of sleeping space, two living areas, and a nice yard allowed room for all. Situated just a little off Main Street offered easy access to shopping. The owners thought of everything for the kitchen, baths, bedrooms, and family areas. The atmosphere of the house let us think we had stepped back in time. We hope it will be available next year when we are ready to reserve it. We loved it! This was a our second time visiting this house. Our experience this time was the same as last. It is a wonderful house with a combination of old charm and new technology that allowed us to chill in the house, get ready to explore the nature around us, and recover from our adventures. There were plenty of everything we needed to cook, clean, and have fun. The owners always communicate well and answer questions promptly. I highly recommend it to anyone wanting to spend time in and around Ouray!! The cleaning fee will be increased to $225 for parties of more than 8 people. Rates subject to change until reservations are confirmed.